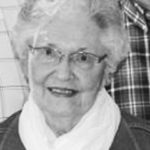 DWIGHT – Dorothy I. Christenson, 92, of Dwight passed away at 4:50 a.m., Monday, February 11, 2019 at Heritage Health in Dwight. Visitation will be from 10 a.m., Friday, February 15, until the funeral service at 11 a.m., in the Dwight United Methodist Church, Dwight. Burial will be in Oaklawn Cemetery, Dwight, following the services. Dorothy was born April 13, 1926 in Streator, a daughter of August and Emma Sorensen Humbert. She married Robert J. Christenson March 2, 1946. He preceded her in death in 2007. She is survived by four children: daughter, Carol (Michael) Hutchings of Morris; sons: Donald (Darnell) Christenson and Thomas (Becky) Christenson, both of Dwight; and David (Barb) Christenson of Oshkosh, Wisconsin. Also surviving are nine grandchildren: James (Audra) Christenson, Brian (Alelie) Christenson, Jason (Katie) Christenson, Kevin (Kristal) Hutchings, Christen (Kurt) Pfeifer, Kara (Josh) Ode, Blake (Beth) Christenson, Mark (Jennifer) Christenson, and Kathy (Doug) Patten. Fifteen great-grandchildren; her sister, Jean Louis of Dwight; sister-in-law, Anna Mae Humbert of Odell; and many nieces and nephews also survive. She was also preceded in death by her parents; son, John Christenson; brothers: Harry Humbert, Robert Humbert and Donald Humbert; sister: Edith Jacobsgaard; brother-in-law, Vince Louis; daughter – in – law, Doris Christenson; sisters-in-law: Helen Humbert and Doretta Humbert; and granddaughter, Linda Christenson. Dorothy worked as a head cook for the Dwight Grade School for many years. She graduated from Dwight schools; was a member of the Dwight Methodist Church and the Dwight Methodist Women’s Group. Dorothy was a devoted wife, mother, grandmother and great-grandmother. She loved to brag on her grandchildren and great-grandchildren. Her hobbies were cooking and baking, especially for big family gatherings. Also, she was an avid bridge player, enjoyed a game of Scrabble, working crossword puzzles, and cheering on the Chicago Cubs and Chicago Bulls in their prime seasons. Her most talented accomplishments were crafting her trademark amazing quilts for herself, her children, grandchildren and great-grandchildren, which she passed on to her daughter, Carol. She and her husband, Bob, spent winters in Texas for 25 years, and enjoyed all of their snowbird out-of-state friends. Memorials in honor of Dorothy may be made to the United Methodist Church of Dwight; Heritage Health Care; and Senior Center in Dwight; or the Kankakee Valley Hospice.